I have a bad habit of eating my lunch way to early during my workday, leaving me with a gap of 6 hours between lunch and dinner. To save my coworkers from getting their heads bitten off as my blood sugar droppes, I need to fill this gap (or rather my face) with healthy snack that keeps me full for a couple of hours. I find energy bars to be a good solutions, and I prefer them to be home made. I’ve tried out a variety of recipes, with a variety of results, but these are a merge between the one that turned out well. They’re tasty, wonderfully sticky, and gets me to dinner without committing murder – not to mention full of healthy goodness. Line a bread form or a rectangular form in similar size with aluminum foil leaving a little overhang on each side. 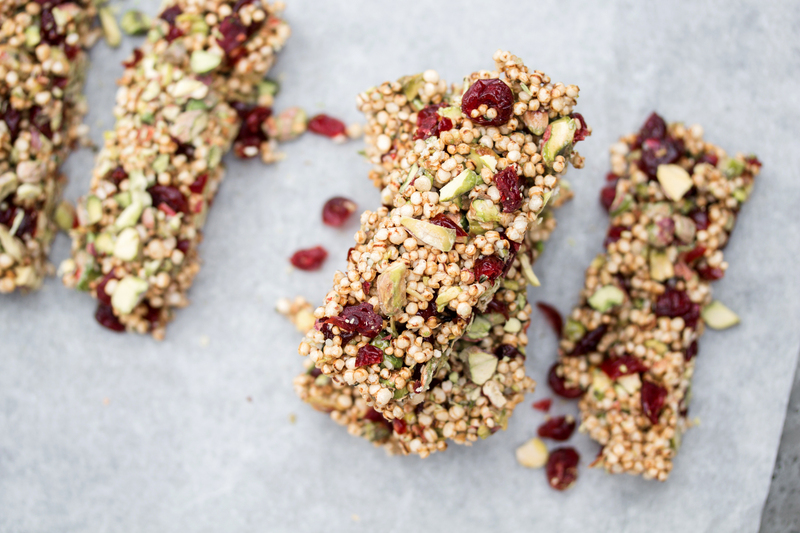 Add the puffed quinoa, pistachios, cranberries and hemp seeds in a large bowl and mix. In a small skillet, bring the honey, syrup to a boil, continually whisking for 2 minutes. Poor the hot mixture immediately over the quinoa mix and stir. Transfer into the form and spread out evenly with no gaps. Set aside to cool for about 20 minutes. 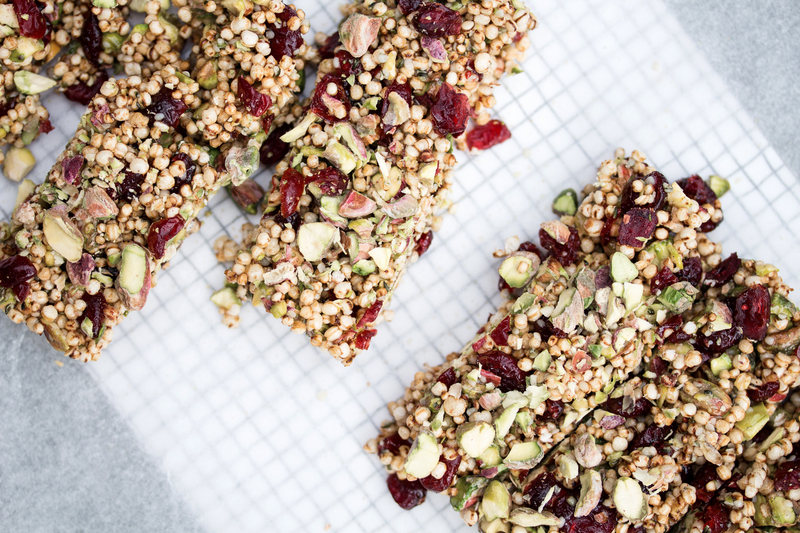 Using the overhang foil, remove the quinoa block from the form and place it on a cutting board. Cut the block into 8 equal sized bars and allow to cool for another 20 minutes.